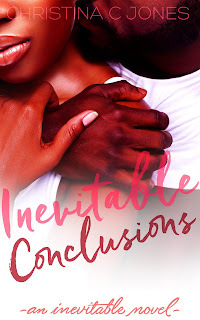 Inevitable Conclusions by Christina C. Jones is the first in (I hope) a new series. The story takes us on a journey with Kora and Tariq. Best friends since toddlerhood, off and on lovers most of their adult life, and undeniable soul mates. We get to watch them as they navigate through their friendship, wanting to become more, trying to become more, but one (or both of them) seeming to get in their own way. But through it all one thing stays constant. They are there for each other: for better or worse, through sickness and health. Will they make their way to the inevitable conclusion that they are meant to be together? Miss Jones does a wonderful job of strapping you into your seat for an emotional rollercoaster of a ride, giving you the highest of highest, dropping you down to the lowest of lows, shocking your senses on the way back up before bringing you to a satisfying stop.